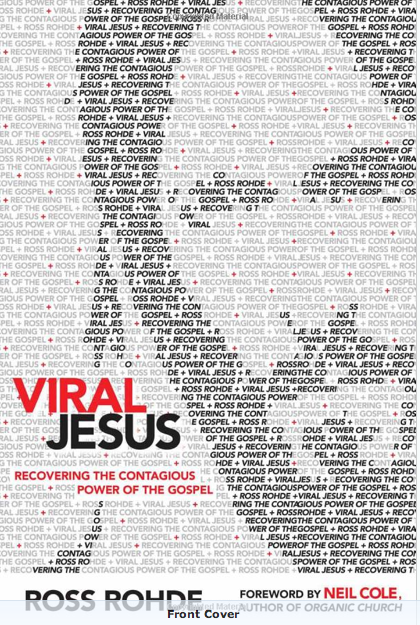 I've been looking forward to the release of Viral Jesus by Ross Rohde for some time. A few months ago I was given the privilege of reading the manuscript and writing an endorsement, and immediately I was struck with the relevance of Ross's message to not just the simple/organic church movement of which both he and we are a part, but far beyond that, to any Christian who desires to make an impact for the Kingdom of God. We have known Ross for several years, and every time we meet him he has a new story of how he has met with a "person of peace" (see Luke 10), led him to become a disciple of Jesus and started a community of Jesus followers. The book is full of stories of supernatural encounters, God working miracles in people's lives. The early church spread like wildfire, spreading throughout the then known world in a comparatively short time. Since then, it has become something different–a lethargic parody of the vibrant life it was supposed to be. Could we see a viral Jesus movement again here in the West? Christianity is meant to be an adventure, we as his ambassadors on mission with God. Do you want to see your church revitalized? In this outstanding book, Ross examines the principles of what it would take to recapture the excitement and viral nature of evangelism and making disciples. Don't start reading this book late at night–you'll not be able to put it down. I highly recommend it. I first learned about Ross when Tony Dale’s blog contained a recommendation to check out Ross’s blog. Ross is one of the finest and clearest writers that I have seen in a long time, and his grasp of Kingdom dynamics is very impressive. I’d recommend anything he writes. Previous Previous post: Potential missionaries, beware!